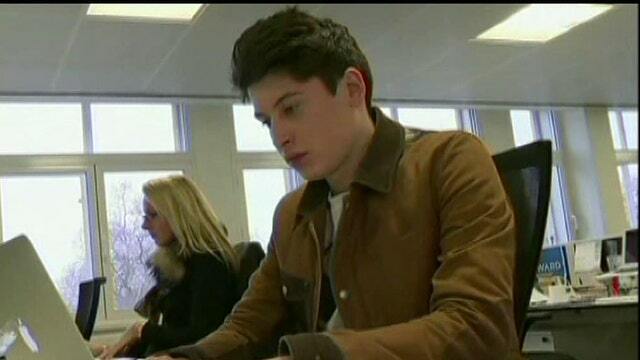 It’s not just 17-year-old Nick D’Aloisio who’s made it big by selling his app Summly to Yahoo for millions. The latest tech superstar is born: 17-year-old Brit Nick D’Aloisio has sold his app Summly to Yahoo for an estimated $30 million. Thanks to success stories like D’Aloisio and Facebook’s Mark Zuckerberg, it can seem like the typical braniac to launch the next-best tech machine is a young wonder. But in reality, the average age of first-time tech entrepreneurs is 39, according to the Kauffman Foundation. And self-employment under the age of 25 actually decreased 19% from 2005 to 2010, says the Small Business Administration. So these million-dollar-making teens are anything but typical. And while unique, there are a number who have found tremendous success – though perhaps not as much publicity as D’Aloisio. FOXBusiness.com spoke with five entrepreneurs who made it big as teens, from best friends who have built an accessories empire from their bedrooms, to a 19-year old Harvard dropout who’s already working on his second company. Kiip’s founder Brian Wong started toying around with graphic design early on in middle school. Skipping four grades in his native Vancouver, Wong graduated from the University of British Columbia at the age of 18. He soon moved to California, where he went to work for Digg as a business development associate. Wong was laid off in 2010 when Digg cut its staff by 10%. So he took off on a trip to explore Southeast Asia. While en route, Wong says he noticed the satisfaction people felt when reaching new highs in mobile games, and the spark that would become Kiip was born. Wong shared his idea for a platform that would allow brands to reward app users for “achievement moments,” and an investor from True Ventures was interested – and brought Wong in to meet the partners. “I totally misunderstood the significance of a partners’ meeting,” says Wong. Today, Kiip has $15 million in funding and more than 40 people working in San Francisco. “Kiip has partnerships with 900 apps and reaches about 55 million devices monthly in the United States,” says Wong. Julianne Goldmark, 17, and Emily Matson, 18, got the idea for their ribbon-like hair ties in the 8th grade, when they became captivated by high-end headbands and hair accessories. So, they went downtown, got their own fabrics and started to make their own just for fun. A lucky connection –Matson’s mother shares the same hairstylist as Jennifer Aniston – led the Friends star to wear one of the girls’ black hair ties on the red carpet, and Marie Claire called the following week. Emi-Jay was born, as the girls scrambled to build a website and up production on the elastic hair ties. Until recently, Goldmark says that she and Matson were still dying elastics and making them by hand at home. Now, they have 30 employees and a wholesale license, and are manufacturing the hair ties in their native LA. Their moms help manage the day-to-day while the girls finish high school, but both are heavily involved, attending all the meetings and designing all the products. Emi-Jay sold 6 million hair ties in 2012, and is projected to sell 10 million of the accessories in 2013. The prices range from $5 to $20. They’ve still got smart heads on their shoulders, though: Goldmark says that the profits are being put away to save for college! As a sophomore in high school, Zwick says he became frustrated by the educational system, and realized that innovation could lead to greater impact. So, he built Flashcards+: an app that enables students to make their own drill cards or use crowd-sourced information to study. Zwick says the app is particularly helpful when it comes to learning languages, as he built an award-winning text-to-speech addition available for 23 languages. After a year at Harvard, Zwick dropped out to become a Thiel fellow (PayPal co-founder Peter Thiel runs a fellowship that encourages young entrepreneurs to leave school to pursue innovation). With $100,000 from Thiel and $150,000 from Y Combinator, Zwick and his cofounder, another Harvard dropout, are hard at work on the Coco Controller, which he describes as a smartphone accessory. Sean Belnick, now 26, honed a taste for ecommerce selling Pokemon cards online at eBay at the age of 14. After teaching himself HTML, he began helping his stepfather maintain the website for his furniture business. Inspired by his stepfather’s business, a 14-year-old Belnick came up with the idea for Bizchairs.com, which sells –you guessed it –office chairs. With a $500 investment he says he used for advertising, Belnick got the site up and running, and started turning a profit after the first sale. Twelve years later, Belnick’s Bizchairs.com will make $100 million this year; he estimates that the company was already seeing revenues of $30 million after five years of business. Belnick credits his curiosity and ambition to his success, though he said that it was much harder to be a teen entrepreneur when he got his start – if only because there were fewer teens attempting to run businesses. Scott Ferreira, 22, and his sister Stacey, 20, launched MySocialCloud.com in 2011, when Scott was a sophomore at USC and his sister was still a senior in high school. The service helps people to remember usernames and passwords online, and actively monitors users’ online presences to help notify them of security breaches. The older Ferreira got his start at the tender age of 9, inspired in part by his father’s job at IBM and an early trip to see Google. At 13, he started work for a company in Malaysia doing database work and creating scripts; he got the job after being referred by an employee from Ohio he met online playing a virtual game. He says the company didn’t realize his age for a long time. Soon after the siblings and a third co-founder began working on the idea for MySocialCloud.com, Stacey saw a tweet from Richard Branson regarding an intimate cocktail party for entrepreneurs in Miami. They reached out and said they were too young to drink, but could they still come? Within 48 hours, they were presenting to Branson, and shortly thereafter he confirmed his investment in the company, which has raised a total of $1 million. In terms of their age, Scott says that not having the responsibility of families gives them more flexibility and allows them to take on more risk professionally. While Scott says the siblings’ parents were always supportive of their decisions, he says they became concerned when the siblings dropped out of college. “As soon as we showed them a photo of Branson visiting our office, they started to calm down!” he adds.